Molded fiberglass grating is a good choice when a lightweight, corrosion-resistant and high impact-resistant material is desired. Molded fiberglass grating from Direct Metals has bidirectional strength, is non-conductive, and easy to fabricate. Under normal use, the available grit surface of the molded fiberglass grating provides excellent, long lasting slip resistance in a variety of surface conditions. Combining unmatched custom-tailored corrosion resistance with strength, longevity, and safety, molded fiberglass products have been proven to deliver years of reliable service, even in the most demanding corrosive conditions that can cause conventional steel grating to deteriorate rapidly. Molded fiberglass grating is a fiberglass-reinforced plastic (FRP) that combines fiberglass rovings with thermosetting resins to form a strong, one-piece molded panel. A 65%/35% resin to glass weight ratio provides high corrosion resistance. Meniscus fiberglass flooring surfaces or applied grit fiberglass flooring surfaces provide slip resistance when compared to other flooring products. This molded fiberglass grating product is better suited for corrosive environments. Molded fiberglass grating offers a number of features that set it apart from other flooring products. Its ability to resist impact is unmatched, yet it weighs about 1/3 that of steel grating and is easy to fabricate, making it less expensive to install. While steel grating requires costly and time-consuming cutting and welding, along with special lifting equipment, molded fiberglass grating involves fewer man-hours, and only simple hand tools for installation – no crane necessary. In fact, the savings on labor and equipment often make the total installed cost of molded fiberglass grating about the same as that of steel; and considering its long, maintenance free life, molded fiberglass grating offers a significantly lower overall life cycle cost. Concern for an ergonomic work environment in facility planning leads more and more companies to rely on the inherent resiliency and flexibility of molded fiberglass grating to increase worker productivity. This greatly reduces back and leg fatigue for those who stand for long periods of time. For enhanced worker safety, molded fiberglass grating is very slip resistant under a variety of surface conditions and is also non-conductive and fire resistant. Molded fiberglass grating is available in both standard and non-standard colors that are continuous throughout. It comes in square, rectangular and micro/mini mesh grid fiberglass patterns. Square mesh molded fiberglass grating has a bi-directional span, which maximizes panel utilization. Furthermore, the use of fully wetted fiberglass rovings embedded in resin provides superior corrosion resistance for most industrial applications. 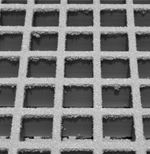 Our mini mesh molded fiberglass grating has 1/4 the opening of regular 1-1/2-inch square mesh grating. The smaller opening prevents objects as small as 1/2 inch from falling through. The close spacing of the bearing bars makes mini mesh fiberglass grating ideal, when looking for smooth movement for small-wheeled trolleys, wheel chairs, etc.